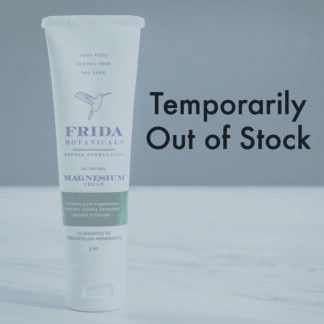 View cart “Frida Botanicals Muscle Balm 2oz” has been added to your cart. 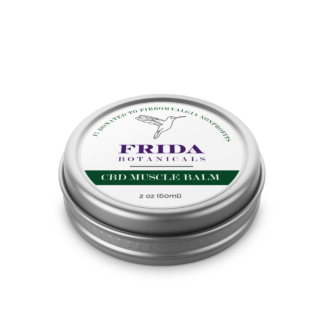 Frida Botanicals CBD Muscle Balm is an effective way to soothe sore muscles and joints. Frida Botanicals CBD Muscle Balm is an effective way to soothe sore muscles and joints. 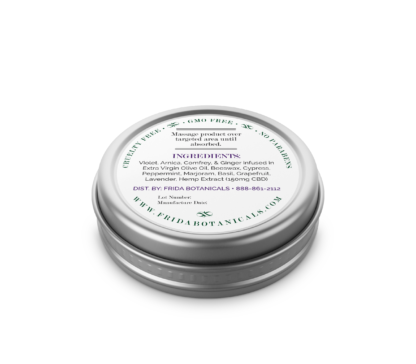 Containing 150mg CBD, this all-natural salve uses the power of hemp oil to relieve physical stressors. An additional 10+ plant extracts, including violet leaf and basil, work synergistically with one another for an overall powerful product. For more information on CBD, see our FAQ page. Directions: Apply the hemp salve directly to the desired area and massage a generous amount into your skin until absorbed. This product truly surprised me. I’ve read Dr. Liptan’s books, and heard her talk about CBD before. In the past, I hadn’t had much success with more THC based products, so I figured this wouldn’t be helpful. Boy was I wrong! This is literally the ONLY thing that has every markedly helped with my lower back pain. Once I rub this in, I just wait fifteen minutes and it’s like my back has been transformed. No more pain when bending, sharp stabbing when standing or dull aching, in general. What’s great is it also lasts almost an entire day! I’m ordering a case of this stuff! I’ve tried a lot of CBD products — this one if my favorite so far. The thing that surprised me most is that it actually smells GOOD. It has nice “slip” meaning that it glides on easily, soaks in well, while also staying around long enough to allow you to massage the area without causing skin irritation. It also provides effective pain relief. Highly recommended. It does help with the pain and seems to relax me as well. I will order more now that it’s available for purchase. Thank you so much Dr. Liptan. I used this balm for sore neck muscles which I had been struggling for over a week. Nothing else seemed to work including ice, heat, NSAIDs, Tiger Balm, and other OTC analgesics. I finally tried this muscle balm by a family member’s recommendation and my pain disappeared after only a few hours. It also soothed the pain with gentle warmth to the area after applying. It smells lovely without being overpowering. I would definitely recommend this balm for any muscle aches or pains, or even just to relax after a long day. First, just taking off the lid I discovered the best smelling CBD product ever- no, make that the best smelling “anything applied to skin” product ever. After that, it became irrresistable. There is no way to remove the lid and NOT dip a finger in to test this golden treasure. It is the perfect combination of subtle scent and velvet texture. But the joy is not only in superior aesthetics, it works far better than any other I’ve tried as well. This muscle balm has become a permanent part of my pain tool arsenal because I know I can depend upon it working. It is a promise fulfilled in every application. 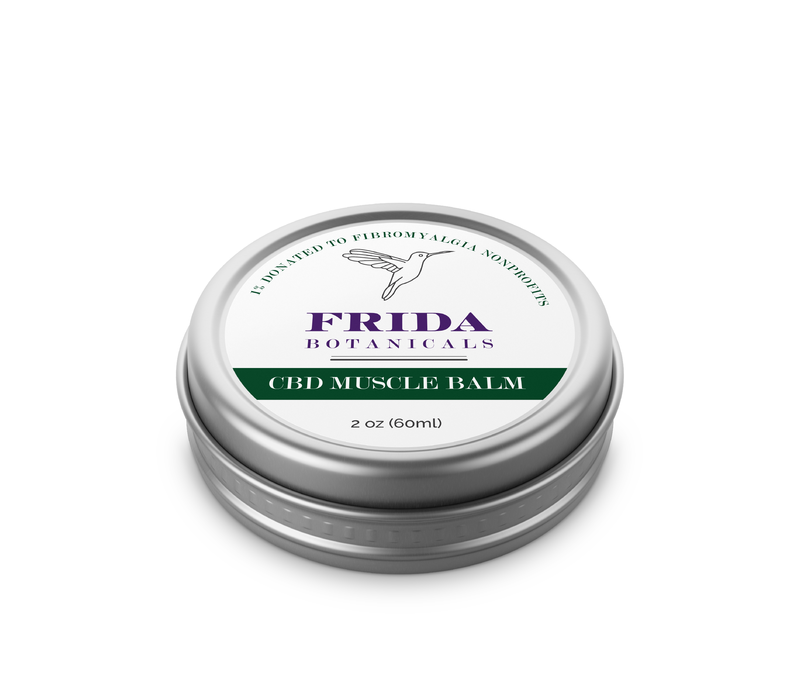 I love this CBD pain balm! I use it on my shoulders & neck areas for stiff arthritic pain and I put it on my cheek, temples and forehead when I get migraines! The scent is subtle and it’s not too greasy. And it’s made with all natural ingredients. It’s packaged in a small round jar, so I keep mine in my purse. It’s a great purchase. I won’t be purchasing any other pain gels besides this one. 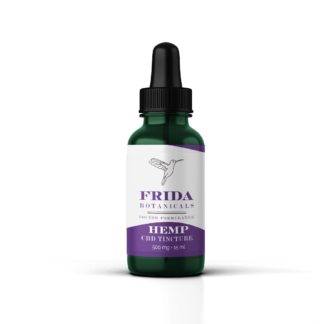 I don’t have fibromyalgia, but my wife does which is how I was turned on to Frida Botanicals, and this product in particular. I work on my computer all day (as many of us do) and get very bad shoulder and neck pain as well as tension headaches. I would take an over the counter anti-inflammatory, but that rarely made a dent. My wife suggested I let her rub some of this CBD balm into my shoulders one evening, and it has been life changing! Within minutes the pain and stiffness literally melted away. I was amazed. I even rub it onto my temples and forehead when I have headaches, and it helps with those too! This has become part of my nightly routine, and now I can’t live without it. I’ve bought five tins already, and it’s the best investment in self care I’ve ever made! Sometimes I layer in their magnesium lotion for extra benefit. Truly incredible. As a human trying to live her best life while managing chronic pain and muscle tension I LOVE the muscle rub, maybe even more than I love the tincture. It smells good and combined with a hot bath results in exactly that melty relaxed feeling I am always in pursuit of. I have a rare congenital vascular disorder that causes me a lot of pain in one lower leg. When my condition is flared up I have relied on ibuprofen to take the edge off. This balm was given to me as a gift and what a gift indeed! You can color me surprised to find that a topical balm could take away the pain I live with continually! It is a powerful pain reliever and now I experiment with it all the time…my husband’s lower back pain, my 85 year old neighbor’s headaches, my arthritic hands. Wow! Successful on all counts; this balm is like magic. I work with my hands and also type a lot so I just rub some in before I work, before there is any pain, and it keeps it from happening. Aside from how effective it is, I’m totally in love with the scent and the feel of it. I use it a lot and feel like I haven’t even made a dent in the tin so am happy to see that it lasts a very long time as a little goes a long way when applying it. I’ll never be without it now. Thank you, Dr. Liptan, for such a powerful product. I’m going to try the magnesium cream next to aid with sleep and see how it affects nighttime leg cramps. Also, I’ve heard that cbd bath salts are really amazing; have you considered making some of those?? I have a lot of jaw, neck and shoulder pain. I have used liquid lidocaine on my jaw and down onto my neck for a long time, and it does help, but I have to re-apply it every hour or two, and the pain never goes completely away. Salon Pas helps my shoulder, but I have used it so often over the years that now it burns my skin. One day I decided to try the Frida balm I’d just bought. I was kind of shocked at how little I needed to completely cover my jaw, all the way down my neck and across my shoulder – just scooped some out on the back of my thumbnail! (It’s a little greasy to me, but it does wash off my hands pretty quickly.) I added the magnesium cream on top of the balm and waited. Just a few minutes later, I realized the pain was completely gone! Not only that, but it continuted to work for the rest of the day – I never needed to re-apply anything until the next time my jaw hurt a few days later. I have now used it four different times, and three times it completely eliminated the pain. (The fourth time it helped, but the pain did not disappear.) I keep forgetting to try it for migraines – maybe now that I have typed this I will remember! I really appreciate Dr. Liptan’s work and research so I had high hopes for this product. I really don’t like leaving a 2 star review, but sadly, this balm hasn’t helped me much. There’s no recommendations for use. I have no idea if I just need a little or to lather it on. Am I simply supposed to rub it on, do a deep massage? A little bit of guidance would have been appreciated. Though, I’ve I’ve tried different application methods and the balm has done little to relieve the deep ache in my legs. The smell is great, especially for people with sensitivity to smell. I’m glad to know it works for others, but not the right product for me. So sorry it didn’t seem to work for you! We’ve had many others tell us how much this has helped them, so we’re very sorry that didn’t seem to be the case for you. As far as how much to apply, if you’re not receiving benefit, we would recommend applying more to the painful area in your leg. If the pain is also a deep pain, massaging the product in as deeply as is comfortable is recommended. Some pains are, unfortunately too deep for the balm to reach and respond better to an oral CBD product like a tincture. Thank you for taking the time to leave us a review, your honest feedback, and for trying our product!